The weekend is over and back to work we go. Hope you had a creative weekend, I know I did! The card I have for you today is for two different challenges. The first one is for Less is More, their request was to ” cut it out”. I have done this technique before, but it’s been awhile. And the other challenge is for Casual Fridays, they asked us to use only Black and White and not a speck of any other color. The card was made for a co-worker that will be leaving us soon, she is a long term sub for the music teacher who has been out this entire school year, she has done a really nice job filling in! I Hope she likes it! Categories: Cards, challenges | Tags: black and white, Card making, Cards, rubber stamps, Thank you card | Permalink. I think you got your challenge topics the wrong way round, but it certainly fits beautifully for both challenges! Hi Nancy, Love how you cut out the circle to reveal the heart inside! I’m sure your co-worker will be very touched that you made her such a beautiful card. I love your little touches of the music sheet-makes me smile 🙂 Thanks for playing with us at CAS-ual Fridays! I see you’ve amended your post Nancy! 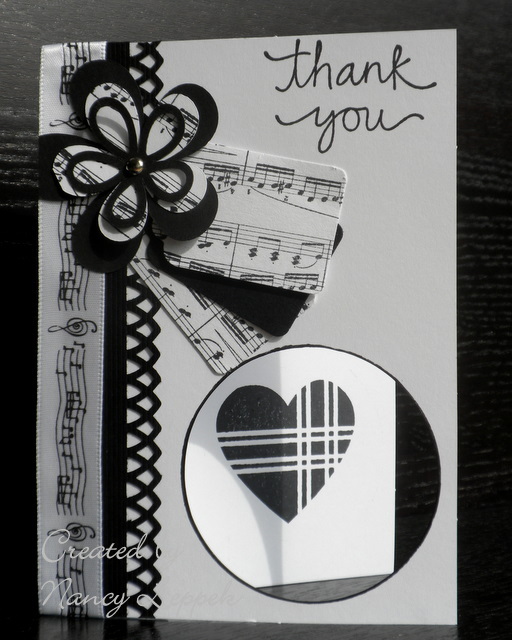 The perfect card to say “thanks” to a music teacher! Maryyyyyyy Please check your email from me! Oooh so classy and striking! Love it Nancy!